Looking for a fun and easy way to ring in the New Year in Myrtle Beach? Check out the New Year’s Eve activities at Captain’s Quarter's Resort! New Year's Eve: Ringing in the New Year in Myrtle Beach – Family Friendly! You can have everything you need (a place to stay, music, champagne, food and fun!) all in one place at a great price. 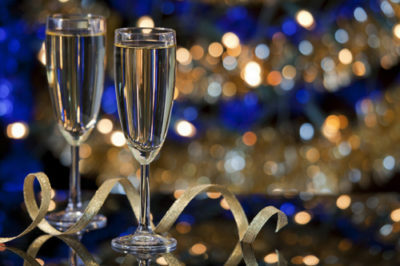 Celebrate New Year's Eve at our Level 6 Entertainment Center! Level 6 will be open from 10 a.m. to 2 a.m. for revelers of all ages. Make sure to attend the midnight champagne toast for adults, and kids will receive sparkling cider for toasting! There is no cover charge to get in, and we will also have fun party favors. Plus, a DJ will be spinning the tunes and there will be specials available on drinks, food, arcade game cards, and bowling. This is the perfect family gathering for New Year’s Eve! Also consider including convenient and special add-ons to your Captain’s Quarters reservation. Don’t worry about getting up early the next morning! For just $25 (tax included) your checkout time will be extended to 1 p.m. and you will receive breakfast for 2 at our Vista Nine restaurant, meaning you can sleep in and get a great oceanfront breakfast! Imagine getting up and enjoying coffee on your oceanfront balcony while watching the sun rise followed by a hot oceanfront breakfast. Is there any better way to start your 2019? For just $30 (tax included), add a bottle of champagne, 2 souvenir Captain’s Quarters champagne flutes, and New Year’s Eve Party favors for 2. Substitute a bottle of sparkling cider for the champagne if you prefer! For the full New Year’s Eve experience, purchase all of the above for just $50 (tax included). You will receive a bottle of champagne, 2 souvenir Captain’s Quarters champagne flutes, New Year’s Eve Party favors for 2, breakfast for 2 at our Vista Nine restaurant, and an extended checkout of 1 p.m.! It’s an amazing value, and a memorable New Year’s has never been so easy! The number of packages that will be sold are limited so be sure to add it when you book your Myrtle Beach New Year’s Eve vacation! Make plans to join us for our fun, upcoming NYE plans. You’ll want to find somewhere you can have fun, get home safely and not spend too much money…so in other words you’ll want to stay at Captain’s Quarters Resort in Myrtle Beach! Be sure to book HERE before it’s too late!